Institute of Tübingen, Germany which was supported by the ERN-RND fellowship program. Below is Tommaso’s testimonial. The ERN-RND fellowship program supports short scientific mission aimed at improving research and care in the field of rare neurological diseases. Actually, thanks to this opportunity, I joined for few days the group of Prof. Matthis Synofzic (see picture) at the Department of Neurodegenerative Diseases of Tubingen University and Hertie Institute of Tubingen, Germany. The main aim of this short-term fellowship was to improve the methodology of data collection in prospective observation of patients, in order to create valuable databases and biobanks, which are critical for future perspectives of neurodegenerative diseases, especially in rare disorders. 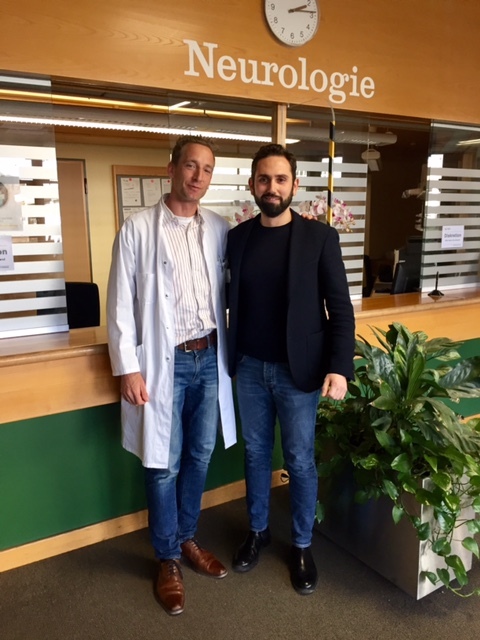 During my stay, I attended the Ataxia clinic of Prof. Synofzic and the Parkinson’s disease clinic of Dr. Kathrin Brockmann at the University Hospital, focusing on the practical organization of visits, which allows systematic clinical evaluation and contemporary biomaterials collection. Then, I could visit the labs of Hertie Institute, where biomaterials are prepared and stored by using advanced systems of control. I also visited the lab of motion analysis at the University Hospital, looking how novel technologies could be integrated in the clinical practice of patients with ataxia. Over the whole period, I received the friendly support of Dr Andreas Traschütz and Dr Selina Reich. Finally, this program allowed to be immersed in the routine work of a very well-known group, whose experience is fundamental to drive and improve research activity of younger colleagues. Moreover, thanks to the direct contact, we shared our ideas and proposal for novel studies but also increased the personal knowledge that is a strong glue for the network.